This article is about the former basketball player. For the Major League Baseball player, see Jo-Jo White. 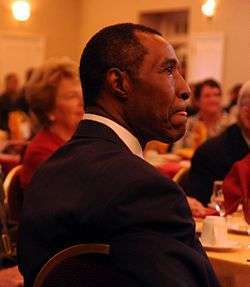 White during his Marine Corps Sports Hall of Fame induction ceremony, 2008. Joseph Henry "Jo Jo" White (born November 16, 1946) is an American former professional basketball player. As an amateur, he played basketball at the University of Kansas and represented the U.S. Men's Basketball team during the 1968 Summer Olympics. As a professional, he is best known for his ten-year stint with the Boston Celtics of the NBA, where he led the team towards two NBA championships, played nine seasons, and set a franchise record of 488 consecutive games played. White was inducted into the Naismith Memorial Basketball Hall of Fame in 2015. White was born in St. Louis, Missouri, the son of a minister. The youngest of seven siblings, he started playing basketball at six and found sports to be a key platform for his community. As a child, he followed the St. Louis Hawks. Due to his age, White was eligible to play college basketball a semester early at the University of Kansas, and team captain Riney Lochmann led a vote to determine that White would be welcomed by the players. White joined the team mid-season and enjoyed immediate success, entering the 1966 NCAA Men's Division I Basketball Tournament. They played dominantly but encountered a physical Texas Western squad, now known as University of Texas at El Paso, in the Midwest regional final. During the first overtime, White took and made a shot (a 35-foot runner) as the buzzer sounded, but he was ruled out of bounds by referee Rudy Marich. The team lost this thriller in the 2nd overtime to Texas Western who went on to win the championship. The game would later go on to be featured in the 2006 film Glory Road about the 1966 Texas Western team. White would become a leader of the team and made the consensus NCAA All-American Second Team in 1968 and 1969. He made the All-Big Eight team the three subsequent years (1967–1969) Due to his early enrollment, White had only one semester of eligibility and Head Coach Ted Owens opted to have White play for the 18 games in the first semester rather than eight in the second. He graduated with a degree in physical education. Going into the Olympic Games we weren’t the overwhelming favorites to win the gold medal. We weren’t even considered the strongest team in the tournament. That billing went to the Russians, who was upset by Yugoslavia in the semifinals. But we were the more determined team, and I think that's what set us apart." This victory would prove to be the last in a streak of seven consecutive gold medals for the US Men's team. White trying to score while being marked by Ernie DiGregorio. "I was a Marine, so I had been through all the physical and mental challenges that comes with military training. Plus I was in excellent condition because of my military obligation, so I feel that this gave me an added advantage." White was also drafted by the Dallas Cowboys and the Cincinnati Reds. However, before White even reported to training camp, the Celtics' center and player-coach Bill Russell announced his retirement and cut ties to the organization. Also, the team's long-time Shooting Guard Sam Jones would end his career, requiring White to replace those duties. With the sudden departure of Russell and Jones, White would endure a rebuilding season where the franchise experienced their first losing season (34-48) since 1950 (the year before Red Auerbach was hired). White made the All-NBA rookie team during the 1970 season. The Celtics got back on track by drafting Dave Cowens, trading for Paul Silas, retaining veteran John Havlicek, and hiring of coach Tommy Heinsohn. With White leading the attack from the point guard position, the team returned to its winning ways in 1971. He was an All-Star for seven straight years from 1971 through 1977, finishing in the top ten in the league in assists from 1973–1977. In 1972, he participated in the now-defunct NBA One-on-One 16-man tournament where he reached the championship (which occurred during halftime of Game 5 of the Finals) and faced 6'11" Detroit Piston Bob Lanier, who used his eight-inch height advantage to win the $15,000 prize. In 1974, White and the Celtics reached the 1974 NBA Finals. They would face the Milwaukee Bucks who were returning with their championship-winning core from the 1971 NBA Finals, including future Hall of Fame members Kareem Abdul-Jabbar and Oscar Robertson. With the Bucks starting point guard, Lucius Allen, injured at the onset of the playoffs, White would lead a small, quick line-up (featuring undersized, All-Star Cowens at Center) towards the first Celtics championship in the Post-Russell era. The following season, White led the Celtics in minutes in a season where they would finish 1st in NBA Atlantic Division with a 60-22 record but lost the Eastern Conference Finals. In 1976, White was part of a dominance Celtics squad which featured 5 veterans averaging double-digit scoring. During the playoffs, White led the Celtics to the NBA championship and was a starring player in what is often referred to as "the greatest game ever played" in NBA history. In the triple overtime win against the Phoenix Suns in game 5 of those finals, White was the game's high scorer with 33 points, had a game high 9 assists, leading the Celtics to a 128-126 win. Logging 60 minutes of play time, only the Suns' Garfield Heard (61) played more minutes. White was named the most valuable player of the 1976 NBA Finals. White went on to become one of professional basketball's first "iron men", playing in all 82 games for five consecutive seasons during the 1970s and setting a franchise record of 488 consecutive games played. White suffered an injury during the 1977–78 season. With the end of the streak, White and the aging Celtics became a less effective squad and followed their championship with an exit from playoff semifinals in 1977 and then two losing seasons. "...being a Celtic, and, specifically, being a part of the Celtic mystique, meant a lot to Jo Jo White. In fact, being a part of the Celtics family and being able to come in and exchange quips with Red Auerbach and being able to identify oneself as a "Celtic" probably meant more to Jo Jo White than to any Celtic in the modern (i.e. post-Russell) era. Circumstances dictated that he leave, but leaving Boston was far from painless." White would retire in 1981 with the Kansas City Kings. He returned to the Jayhawks as an assistant coach from 1982–83. In 1987 at the age of 41, White attempted a professional comeback as a player-assistant coach with the Topeka Sizzlers of the Continental Basketball Association. The Boston Celtics retired White's #10, barring its future use among the team's players. 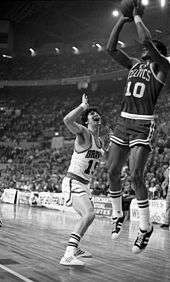 On Friday, April 9, 1982, his number 10 was hung from the rafters at the Boston Garden. He is in currently in the top 100 in the NBA for career total field goals made, field goals attempted, assists, free throw percentage, minutes per game, and defensive rating. He made the All-NBA Second Team in the 1974–75 and 1976–77 NBA seasons. White continues to be involved in basketball and is currently director of special projects and community relations with the Celtics, while continuing to attend most home games. In 1997, he was inducted into the Kansas Sports Hall of Fame. His jersey was retired by the Kansas Jayhawks in 2003. He was inducted in the Marine Corps Sports Hall of Fame with the class of 2009. He also joined the 2013 class of the St. Louis Sports Hall of Fame. Previous to his induction in 2015, White's long exclusion from the Basketball Hall of Fame was a common topic when discussing players who have long been eligible but have not been inducted, with most writers believing his entry has been long delayed. One writer in 2012 went as far as to declare a Jo Jo White Threshold as a marker for viability among future candidates. According to Basketball Reference, White has the highest calculated probability of induction among eligible candidates, yet ranks 156th in Win Shares among 2014 eligible candidates when only considering his NBA career. Previous to his induction, NBA.com lists White as an "NBA Hall of Famer" in his player profile. In the 2010 "Book of Basketball", Bill Simmons lists White on his Hall of Fame pyramid as one of the 96 greatest basketball players of all time, albeit at #95. White was born with six older brothers and sisters. He has married twice, currently to Deborah White and previously to Estelle Bowser. Chris Chambliss is a cousin of White's. In 2009, White and his wife opened a restaurant, JoJo's West, in the Maynard, Massachusetts, which declared bankruptcy and closed in 2010 with criminal allegations and litigation against restaurant partner Chris Barnes. "When you saw him the first couple of times you were extremely worried. But we jokingly said that JoJo could make sick cool. He really is a cool dude and a great human being." In September 2012, White started the Jo Jo White Foundation to provide support for brain cancer research. He also previously led the Jo Jo White Growth League for children in middle school  starting in 1994. 1 2 "JoJo White – Celtics Legend". nba.com. Retrieved July 1, 2015. 1 2 "Celtic Nation: The unofficial home of the Boston Celtics". Celtic Nation.com. Retrieved July 1, 2015. ↑ "Glory overrode". hoopszone.net. Retrieved July 1, 2015. ↑ "Eddie Mullens Remembers". utepathletics.com. Retrieved July 1, 2015. ↑ Botkin, Trey. "Reliving The Memories: 1966 Cinderella Texas Western". Bleacher Report. Retrieved July 1, 2015. 1 2 "Film Review ***: ...Glory Road... Worth Traveling". mit.edu. Retrieved July 1, 2015. ↑ "Consensus All-America Teams (1960 to 1969)". College Basketball at Sports-Reference.com. Retrieved July 1, 2015. 1 2 3 "Jo Jo White". hoopszone.net. Retrieved July 1, 2015. ↑ "The Golden Age of Amateur Basketball". google.com. Retrieved July 1, 2015. ↑ "Edición del Thursday 24 October 1968, Página 10 - Hemeroteca - MundoDeportivo.com". mundodeportivo.com. Retrieved July 1, 2015. ↑ "Celtic Nation: THE unofficial home of the Boston Celtics". celtic-nation.com. Retrieved July 1, 2015. ↑ "1969 NBA Draft". Basketball-Reference.com. Retrieved July 1, 2015. ↑ "NBA Season Recaps". NBA.com. 1 July 2014. Retrieved July 1, 2015. ↑ "The Jojo White Interview". Celtic Nation.com. November 26, 2012. Archived from the original on December 2, 2012. ↑ Taylor, John (2005). The Rivalry: Bill Russell, Wilt Chamberlain, and the Golden Age of Basketball. New York City: Random House. pp. 358–359. ISBN 1-4000-6114-8. ↑ "1969-70 Boston Celtics". Basketball-Reference.com. Retrieved July 1, 2015. ↑ "1949-50 Boston Celtics". Basketball-Reference.com. Retrieved July 1, 2015. ↑ Hilton, Lisette. "Auerbach's Celtics played as a team". espn.go.com/classic. Retrieved August 28, 2009. ↑ Matthews, David (May 18, 2010). "Watch The 1972 NBA One-On-One Championship, In All Its Glorious Weirdness". Deadspin. Retrieved July 1, 2015. ↑ "NBA.com: Celtics Win First Title of Post-Russell Era". nba.com. Retrieved July 1, 2015. ↑ "1974-75 Boston Celtics". Basketball-Reference.com. Retrieved July 1, 2015. ↑ "1975-76 Boston Celtics". Basketball-Reference.com. Retrieved July 1, 2015. ↑ "GREATEST GAME EVER – THE OFFICIAL SITE OF THE PHOENIX SUNS". nba.com. Retrieved July 1, 2015. ↑ "35 Years Ago: The Celtics and the Suns Play The Greatest NBA Finals Game Ever Played". Boston Sports Then & Now. Retrieved July 1, 2015. ↑ Black, Martin. "The Phoenix Suns: The Unluckiest Franchise In Professional Sports". Bleacher Report. Retrieved July 1, 2015. ↑ "141. Jo Jo White.". nbahoopsonline.com. Retrieved July 1, 2015. ↑ Barrasso, Justin. "Bird's Rookie Year — Game 38 vs. the Warriors". Boston Sports Media Watch. Retrieved July 1, 2015. ↑ "Jo Jo White Makes a Return at 41 With a Helping Hand as His Goal". The New York Times. 1987-11-18. ↑ "Kansas Sports Hall of Fame – White, Jo Jo". kshof.org. Retrieved July 1, 2015. ↑ "Jayhawks in the Rafters". KUsports.com. Retrieved July 1, 2015. ↑ "MCCS – Recreation and Fitness- Sports". usmc-mccs.org. Retrieved July 1, 2015. ↑ O'Neill, Dan (June 9, 2013). "Stellar class headed to St. Louis Sports Hall of Fame". St. Louis Post-Dispatch. Retrieved July 1, 2015. ↑ Chiari, Mike. "Basketball". Bleacher Report. Retrieved July 1, 2015. ↑ Forsberg, Chris. "Basketball". ESPN. Retrieved November 4, 2016. ↑ "Hall of Fame still neglecting a few greats". ESPN.com. Retrieved July 1, 2015. ↑ https://sports.yahoo.com/nba/news?slug=ycn-7857072 Archived February 26, 2011, at the Wayback Machine. ↑ "Hall of Fame Travesty – Jo Jo White". Yardbarker.com. September 2, 2012. Retrieved October 21, 2015. ↑ Clark, Jeff. "Wait, Jo Jo White Isn't In The Hall of Fame?". CelticsBlog. Retrieved July 1, 2015. ↑ "8 NBA Players That Should Be Enshrined in the Basketball Hall of Fame". The Cheat Sheet. Retrieved October 21, 2015. ↑ "The Lowdown Hall of Fame Snubs: Jo Jo White". Hardwood Paroxysm. Retrieved July 1, 2015. ↑ "Current Players Below The JoJo White Threshold – RealGM Articles". realgm.com. Retrieved July 1, 2015. ↑ "NBA & ABA Leaders and Records for Hall of Fame Probability". Basketball-Reference.com. Retrieved July 1, 2015. ↑ "2016 Hall of Fame Candidates". Basketball-Reference.com. Retrieved July 1, 2015. ↑ "Bill Simmons Hall of Fame Pyramid". Basketball-Reference.com. Retrieved July 1, 2015. ↑ "Make It Count". google.com. Retrieved July 1, 2015. ↑ "Celtics great opens restaurant with career criminal". myfoxboston.com. 16 November 2010. Retrieved July 1, 2015. ↑ "JoJo blames tangled Web for eatery woes". newsbank.com. May 4, 2010. p. 18. Retrieved July 1, 2015. ↑ "Jo Jo White". IMDb. Retrieved July 1, 2015. ↑ "Boston Celtics great JoJo White, recovering from brain surgery, says he's doing 'absolutely fantastic'". masslive.com. Retrieved July 1, 2015. 1 2 Spears, Marc J. (October 16, 2013). "Celtics great JoJo White makes determined recovery from brain surgery". Yahoo! Sports. Retrieved October 21, 2015. ↑ "ABOUT US". JoJo White Foundation. Retrieved July 1, 2015. ↑ Leung, Shirley (February 2, 1997). "Jo Jo White tosses the ball to youth Celtics great brings character-building basketball league to 2 middle schools". highbeam.com. Retrieved July 1, 2015. ↑ "Nonprofit Profile for ASSOCIATION OF JOJO WHITE GROWTH LEAGUES INC". guidestar.org. Retrieved October 21, 2015. ↑ "Jo Jo White". College Basketball @ Sports-Reference.com. Retrieved July 1, 2015. 1 2 "Jo Jo White". Basketball-Reference.com. Retrieved July 1, 2015. Wikimedia Commons has media related to Jo Jo White.